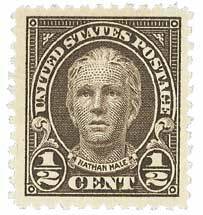 Born in Coventry, Connecticut, Nathan Hale graduated with first class honors from Yale College in 1773. He accepted a lieutenant’s commission from the Connecticut Assembly, and took part in the siege of Boston. 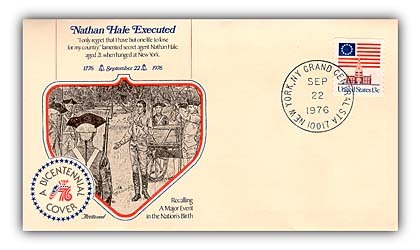 Item #93034 – Commemorative cover marking the 200th anniversary of Nathan Hale’s hanging. When the British left Boston and entered the New York area, Hale was among the patriots that went to continue fighting there. Hale’s bravery and leadership had already earned him the rank of captain in the Continental Army. His leadership in the capture of a British supply vessel guarded by a warship won him a place in the Rangers. This elite fighting group was used for the most dangerous and crucial missions. Preparing for the Battle of Long Island, General George Washington asked the Ranger’s commander to select a man for a surveillance mission. Before he could pick anyone, Hale volunteered. Disguised as a Dutch schoolmaster, Hale managed to pass through enemy lines. But, he was captured before he could return. Hale was found to be a spy and condemned to hang. 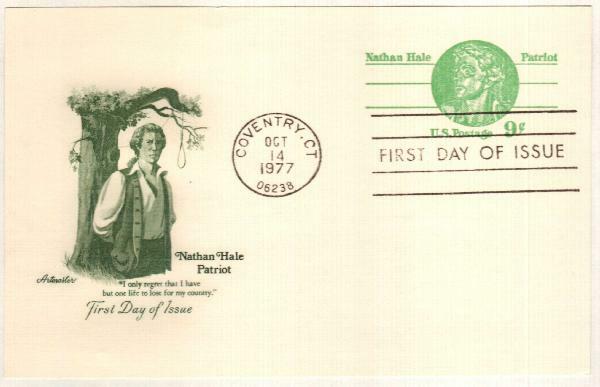 U.S. #UX72 – Postal card depicting Hale’s death. The 21-year-old was remarkably calm before his execution. Multiple reports claim that Hale made a final speech before his hanging, claiming, “I regret that I have but one life to give my country.” Stories of Hale’s patriotic speech were relayed from British officers to American officers, who shared it with the public, making Hale a national hero. Whether the words were his own, or taken from the play, even the British officers that witnessed his final moments admitted that Hale exhibited bravery and composure, making him a true American hero. 8 Responses to "This Day in History… September 22, 1776"
How can Hale be a “true American hero” when he was executed for being a spy? He was spying ON the British FOR the Americans. The fact that he was not wearing his military uniform, but disguised as a schoolmaster, automatically made him a spy in British eyes, and it was the British who hanged him. Hale was an American spy. He was hanged by the British. Have to have spies as you’re sunk without good intelligence. Look at the modern day Iraq War. Takes a lotta guts to gather intelligence for your country. Talk about dangerous missions. He is a hero indeed. Because he did it for his country! Thanks for the rest of the story. Nathan Hale lost his life in defense of freedom. He is a hero that can not be denied. May he forever rest in peace. I love these daily reminders of history. Which Rangers was he a member of?